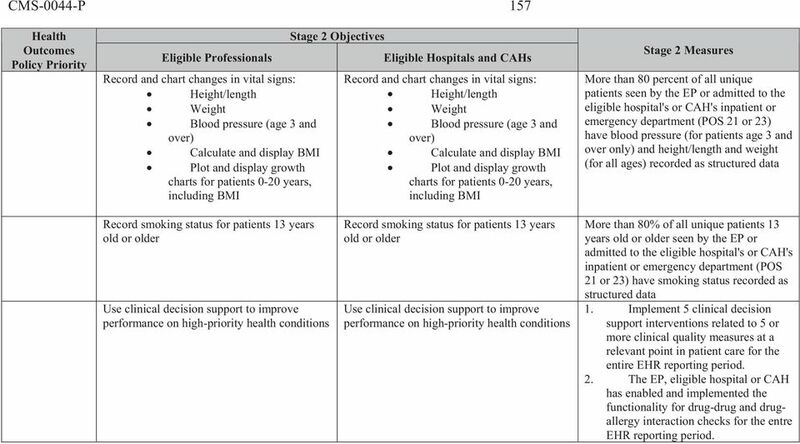 Download "TABLE 4: STAGE 2 MEANINGFUL USE OBJECTIVES AND ASSOCIATED MEASURES SORTED BY CORE AND MENU SET"
2 CMS-0044-P 157 Record and chart changes in vital signs: Height/length Weight Blood pressure (age 3 and over) Calculate and display BMI Plot and display growth charts for patients 0-20 years, including BMI Record and chart changes in vital signs: Height/length Weight Blood pressure (age 3 and over) Calculate and display BMI Plot and display growth charts for patients 0-20 years, including BMI More than 80 percent of all unique patients seen by the EP or admitted to the eligible hospital's or CAH's inpatient or have blood pressure (for patients age 3 and over only) and height/length and weight (for all ages) recorded as structured data Record smoking status for patients 13 years old or older Use clinical decision support to improve performance on high-priority health conditions Record smoking status for patients 13 years old or older Use clinical decision support to improve performance on high-priority health conditions More than 80% of all unique patients 13 years old or older seen by the EP or admitted to the eligible hospital's or CAH's inpatient or emergency department (POS 21 or 23) have smoking status recorded as structured data 1. 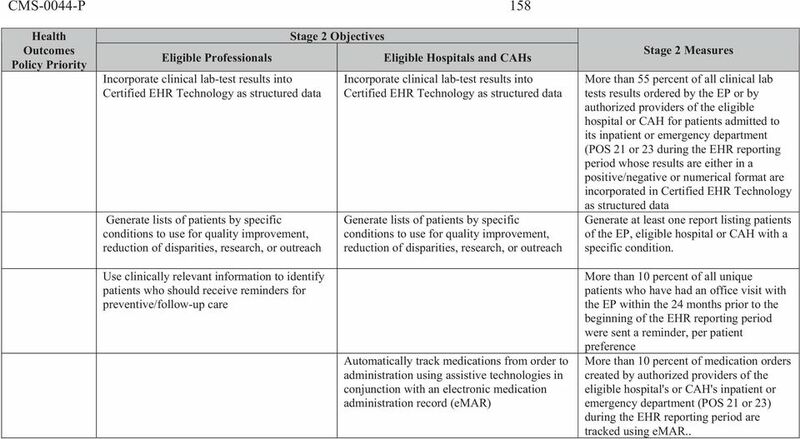 Implement 5 clinical decision support interventions related to 5 or more clinical quality measures at a relevant point in patient care for the entire EHR reporting period. 2. The EP, eligible hospital or CAH has enabled and implemented the functionality for drug-drug and drugallergy interaction checks for the entre EHR reporting period. 3 CMS-0044-P 158 Incorporate clinical lab-test results into Certified EHR Technology as structured data Generate lists of patients by specific conditions to use for quality improvement, reduction of disparities, research, or outreach Incorporate clinical lab-test results into Certified EHR Technology as structured data Generate lists of patients by specific conditions to use for quality improvement, reduction of disparities, research, or outreach More than 55 percent of all clinical lab tests results ordered by the EP or by authorized providers of the eligible hospital or CAH for patients admitted to its inpatient or emergency department (POS 21 or 23 during the EHR reporting period whose results are either in a positive/negative or numerical format are incorporated in Certified EHR Technology as structured data Generate at least one report listing patients of the EP, eligible hospital or CAH with a specific condition. Use clinically relevant information to identify patients who should receive reminders for preventive/follow-up care Automatically track medications from order to administration using assistive technologies in conjunction with an electronic medication administration record (emar) More than 10 percent of all unique patients who have had an office visit with the EP within the 24 months prior to the beginning of the EHR reporting period were sent a reminder, per patient preference More than 10 percent of medication orders created by authorized providers of the eligible hospital's or CAH's inpatient or during the EHR reporting period are tracked using emar..
4 CMS-0044-P 159 Engage patients and families in their health care Provide patients the ability to view online, download, and transmit their health information within 4 business days of the information being available to the EP. Provide clinical summaries for patients for each office visit Provide patients the ability to view online, download, and transmit information about a hospital admission 1. More than 50 percent of all unique patients seen by the EP during the EHR reporting period are provided timely (within 4 business days after the information is available to the EP) online access to their health information subject to the EP's discretion to withhold certain information 2. 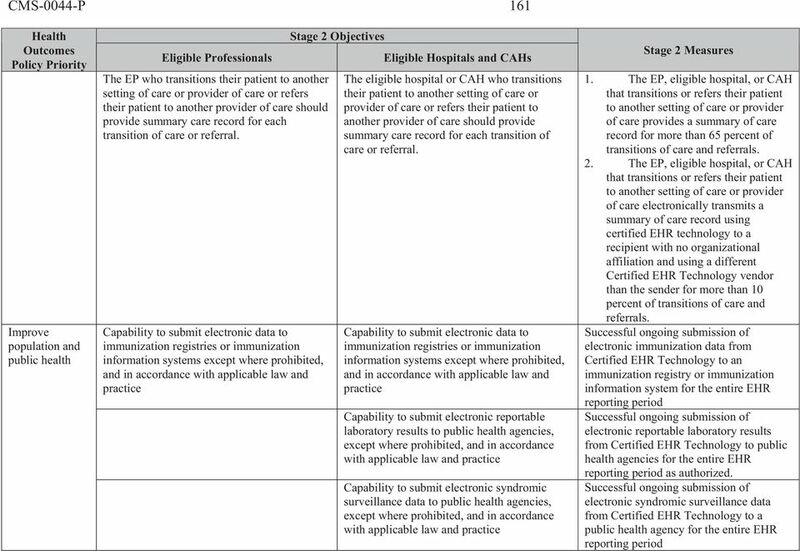 More than 10 percent of all unique patients seen by the EP during the EHR reporting period (or their authorized representatives) view, download, or transmit to a third party their health information 1. More than 50 percent of all patients who are discharged from the inpatient or emergency department (POS 21 or 23) of an eligible hospital or CAH have their information available online within 36 hours of discharge 2. 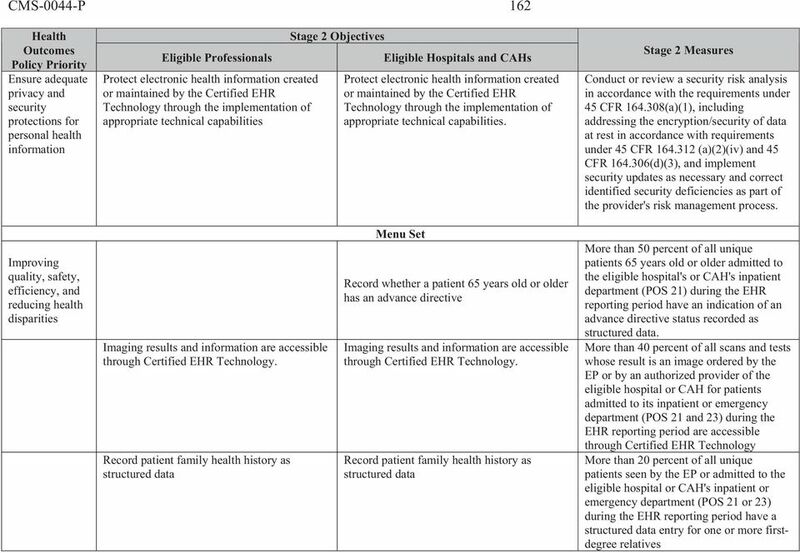 More than 10 percent of all patients who are discharged from the inpatient or emergency department (POS 21 or 23) of an eligible hospital or CAH view, download or transmit to a third party their information during the reporting period Clinical summaries provided to patients within 24 hours for more than 50 percent of office visits. 5 CMS-0044-P 160 Improve care coordination Use Certified EHR Technology to identify patient-specific education resources and provide those resources to the patient Use secure electronic messaging to communicate with patients on relevant health information The EP who receives a patient from another setting of care or provider of care or believes an encounter is relevant should perform medication reconciliation. Use Certified EHR Technology to identify patient-specific education resources and provide those resources to the patient The eligible hospital or CAH who receives a patient from another setting of care or provider of care or believes an encounter is relevant should perform medication reconciliation Patient-specific education resources identified by Certified EHR Technology are provided to patients for more than 10 percent of all office visits by the EP. 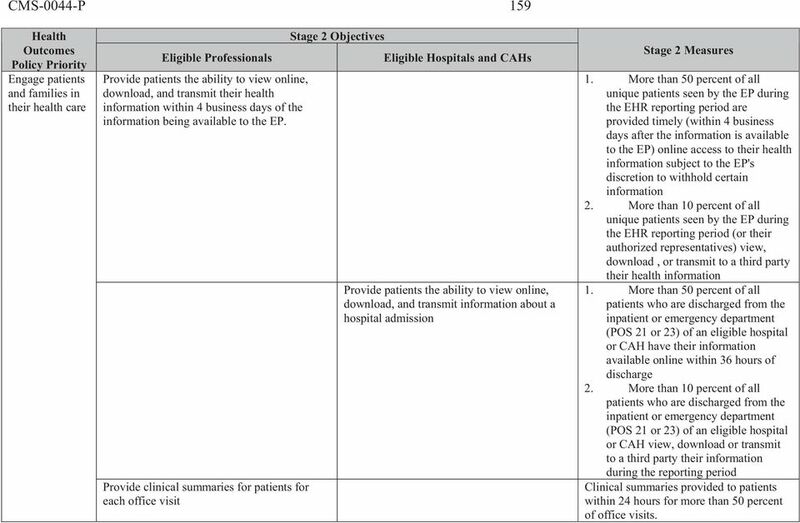 More than 10 percent of all unique patients admitted to the eligible hospital's or CAH's inpatient or emergency departments (POS 21 or 23) are provided patient- specific education resources identified by Certified EHR Technology A secure message was sent using the electronic messaging function of Certified EHR Technology by more than 10 percent of unique patients seen during the EHR reporting period The EP, eligible hospital or CAH performs medication reconciliation for more than 65 percent of transitions of care in which the patient is transitioned into the care of the EP or admitted to the eligible hospital's or CAH's inpatient or emergency department (POS 21 or 23). 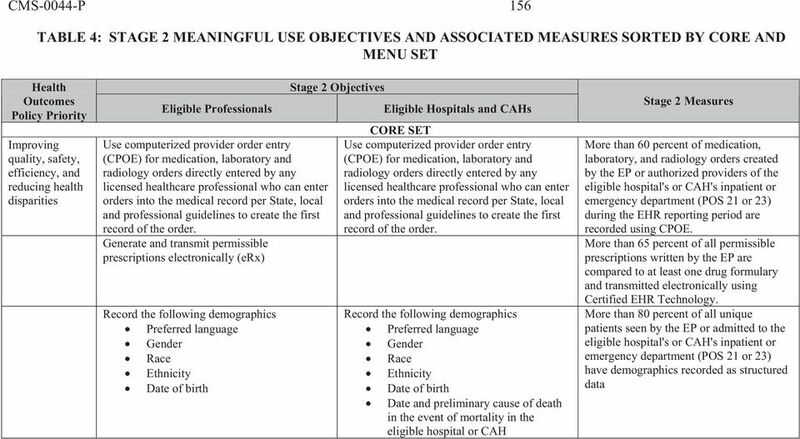 Use CPOE for medication, laboratory and radiology orders directly entered by any licensed healthcare professional who can enter orders into the medical record per State, local and professional guidelines.